Stackopolis trains concentration and quick thinking. Stack the blocks in exactly the right configuration to build a new section of the city. You're on a timer, so there's no time to waste! Be warned, this brain game is highly addictive. Once you start, you might not want to stop until you've completed all 20 levels. Fortunately, at the end of each level you are given a passcode for the level. That way, you can start again from where you left off the last time. If you like this game, you might also enjoy other free block-building games on this site, such as Bloxorz and Super Stacker 2. HOW TO PLAY. Use your mouse to quickly move blocks to the correct position on the board. To move a block, click the block then click the location where you want it to go. A map of the desired stacking pattern displays in the lower left of the screen. Numbers on the map indicate how deep to stack blocks in each location. For example, if a "3" is displayed in the lower left corner of the map, then you need to stack the blocks three deep there. These are not random stacking patterns. Each stack forms a shape representing part of a city. Thus the "-opolis" in the name. For instance, one shape might be the state penitentiary; another might be a lamp post. This game is very challenging. It took me a while to get past just the first few levels. Take a few seconds at the beginning of each level to study the map. Get a good picture in your mind of how deep the blocks need to be at various locations. Studying the map uses a few moments up front but saves you a lot of time later. Also, try not to move any block more than once. That wastes time. Don't try to go too fast, either, or you will make more mistakes. 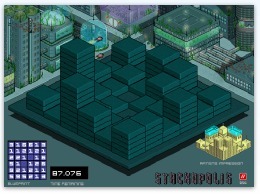 Stackopolis is fun and mentally stimulating. After a few minutes playing this challenging game your brain will be in super-concentration mode! Game distributed by HybridArcade.com. Used with Permission.